In late 1956, Paul Klipsch offered a young man a job as staff musician. Mr. John Eargle was just finishing his stint in the military, and wanted to put his degree in organ from the Eastman School of Music to work. John grew up in Texarkana, some 30+ miles from Hope, and had worked part-time for Paul at least as early as 1953. 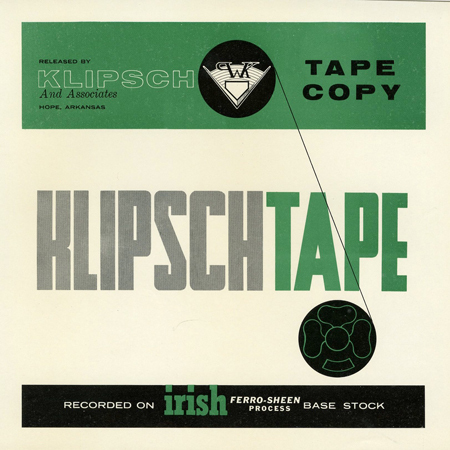 John came on board in early 1957 and the KlipschTape Division was born. The venture was the commercial sale of pre-recorded stereo music. Likely as not, it was justified by providing exemplary demonstration material for showing off the Klipschorn at the many trade shows of the day. After two years the venture was abandoned. Paul would later write that it was a $10,000 loss (about $78,000 in 2012 dollars). Other tapes are being surveyed now in the hopes of more gems.